Which Events are Most Likely to Impact Organizations? - BC Management, Inc. Which Events are Most Likely to Impact Organizations? 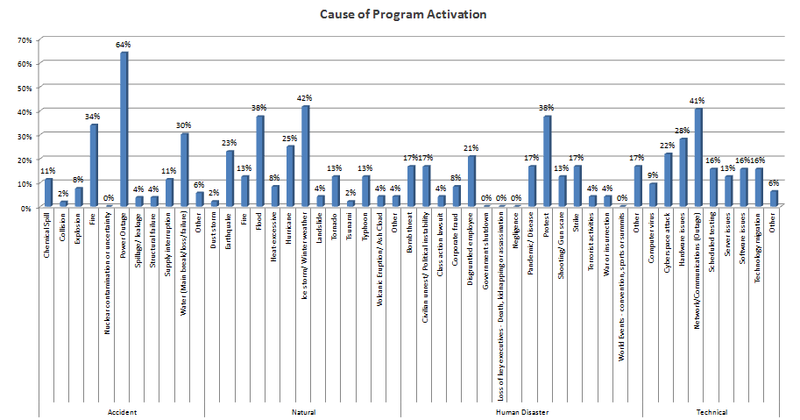 Have you experienced an event in the past year where one or more of your plans in your Business Continuity Management Program (Emergency Response, Crisis Management, Incident Response, Business Continuity and/or Disaster Recovery) were invoked/ activated (pre-event alert/ preparation, disaster alert, partial declaration or full disaster declaration)? Just one week into our 5th Annual BCM Program Management Event Impact Management Assessment and we're already starting to assess the study findings. Click on the graph above to view a larger image.